We were approached by a fun client this summer to transform the shared bedroom of her two, twin girls -- a big girl, room update (if you will) -- before they started kindergarten. Of course, we jumped at the opportunity. We love a kid's project! Check out the girls' room before. Purple paint, heavy window coverings made for a dark, drab space. First step was to brighten this up and bring in the natural light! After getting input from the girls' (natch), we knew they wanted the room to be colorful, but not overpowering; warm and cozy, but still energetic and playful. Above all, we wanted to be make sure the room reflected the twins’ bubbly personalities. Our design process started with what to do for a wall treatment. The slanted wall seemed the perfect opportunity to wallpaper, so we ended up with Romo’s Garland Wallpaper in Cherry that kept it girly, but in a fresh, modern way and it provided a great backdrop for the addition of some fun, bunk beds. To create a unique touch and infuse the room with a little more playful energy, we had the trim and closet doors painted in Sherman Williams Aquarium. The ceiling was painted in a lighter color to move the eye upward, toward our new, vertical furniture pieces that we added to the room -- the bunk beds and canopy for the reading nook. 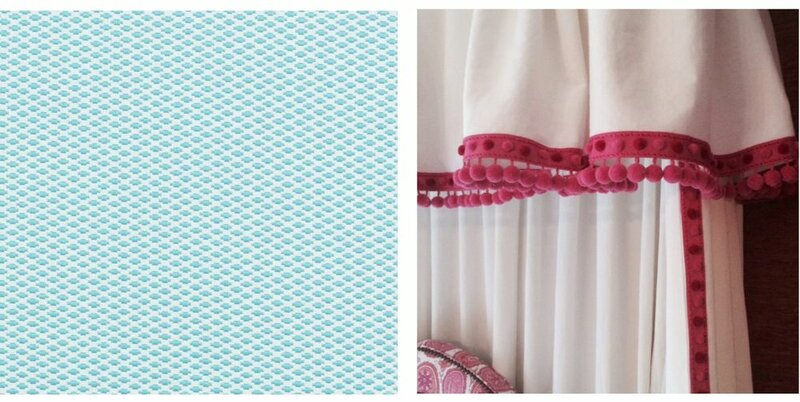 Left: Sherwin Williams Aquarium and Right: Romo's Cherry Garland Wallcovering. Of course, every kindergartner has to have a spot for their studies! The homework area features an adjustable desk by Land of Nod and pink curvilinear chairs by Vitra. The gallery wall above the desk was done economical with interesting frames and sculptural pieces from Joann Fabrics and Hobby Lobby. 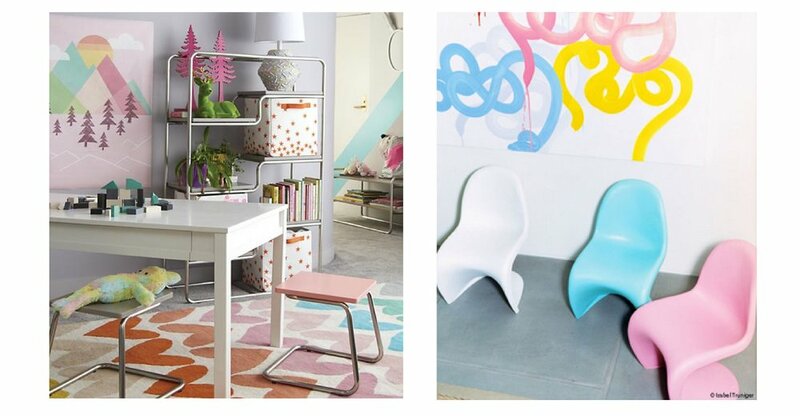 Left: Land of Nod desk and Right: kid's chairs by Vitra. We created a cozy, reading nook with a daybed mattress from Urban Outfitters and a soft canopy by Blue House Joys. The window treatment behind the reading nook was softened with a textural roman shade in Duralee fabric and accented with pom pom trim by Samuel + Sons. The adorable mod little X Marks the Spot book caddy is from Land of Nod. Left: Duralee fabric and Right: Samuel and Son's pom fringe. The corner storage bench from Ikea makes end of the day cleanup a snap and also adds a pop of soft pink to an otherwise forgotten corner. And after! All the gorgeous details coming together! We LOVE how this color combo turned out. We were flattered to be asked to give this space a fresh and grown up look and we were thrilled with the outcome. Not to mention, some super happy mini clients, too! Score! Ok, so we took an accidental blog hiatus for like...three months. Blame it on the busy. Business has been boomin' (not complaining) and the blog unfortunately took a backseat. Say all that three times fast. Yes, we've been M.I.A, but since we last blogged we've made so many AMAZING, new artistic discoveries that we don't have enough walls to fill with their insane talent. Naturally, we are anxious to share some of our newfound FAVORITE, Chicago artists that we've been cartwheeling around town about with our readers. Lynn Basa. We found this knockout on - believe it or not - Instagram. God bless social media. As soon as we clicked on her website portfolio, we were floored. Had to have her. In fact, we are currently commissioning a four-piece work on paper to hang in a project we are doing downtown. We are torn though - don't know what we love more - her simplistic and stunning charcoal works on paper or her rich, organic paintings in both bold and natural tones. We'll take both, please. Oh, Sally Ko. Taya and I stumbled upon Sally through a friend in the design business who is also a huge fan of her work. We were HUMBLED to be able to visit Sally's studio in Bridgeport at the Zhou B Art Center a few weeks ago. We were overwhelmed! Sally makes her own paint and has a fascinating dripping technique that is so unique that helps to creates these mesmerizing pieces. We also love the breadth of her palette - from her deep reds and fun blues to her use of black, white and grey. We snagged one of her beautiful works on paper that we just installed in a client's powder room. It is perfection. Yes, Elliot Bergman the musician is ALSO a frickin' amazing artist. I admired his work years ago and he came back on my radar recently when I was sourcing art for a project. I sent Taya on a hunt to find him about a month ago to no avail. Low and behold, a few weeks ago I got an email from my spirit animals over at Pavilion Antiques who have recently acquired some of his works in their showroom. BINGO. His india ink works are my fav - natch. Black and white and GORG - he uses this amazing stamping technique that creates these amazing, layered and textured pieces. I need a duo in my house (or a project). STAT. Last but not least, one of our local favs: Michael McGuire. You have heard me talk about MM before. My blog post from back in March 2014 talked about my discovery, obsession and my dream to have his work in my home and/or a client's. Well, my wish came true! MM and I worked on a commissioned pen and ink dipytque for a client that was installed back in April. It was a true pleasure collaborating with him and his work is masterful - uncannily precise and boldly graphic. Hope to collab with him again VERY soon. Hoped you enjoyed our "comeback" blog entry. Check out all these local artists during your free time this summer. They are all knockouts. I think we've finally turned that corner to S-P-R-I-N-G! Finally. We are constantly being pummeled with the fabulous pastels and bright colors of our favorite season of the year through all fashion and interior design outlets which has inspired our fun A-List selections for this month. Top Row: How Carrie Bradshaw are these pink, suede Obi pumps from Pierre Hardy? I want them for dress up in my Sunday best and for dress down with jeans for a night out on the town. If your shoes are taken care of, now your walls need some lovin' - the hand-dyed gorgeousness that is Shibori Cityscape Indigo Wallcovering from Milton and King needs to happen in a powder room for a client as soon as humanly possible. Both shades are delectable. Anthropologie has been BRINGING it lately with the home accessories. We love this lime green ceramic guy called the Calo. Is it a stool, a side table, both? We love it's malleability and it's perfect spring, green shade of yumminess. A fun pop in our next project. Even though we are fresh back from a wonderful vacay to Puerto Rico, I still wish I was Currently Offline with this fab sunhat from chapeau maven, Eugenia Kim. Second Row: Oh, Fire Clay Tile how we love thee? Currently coveting your Chaine Femme tile in Sea Foam. So tropical feeling and the geometric, interlocking chain vibe has got us wrapped around your little fingers. Hi Dwell Studio, we will take 1 of your fabulous Athena Lounge Chairs in that powerful pink to grace my pretty little porch this spring. Great lines, comfy sit. Sold. We never turn down a fun little bauble so the Pearl Cluster Ring from Erin Wasson's line is looking for a home in our fun, spring jewelry collection. Plus, her logo is AMAZING. Props. More lounge love goes out to the peeps at Haute Living again with the Wagner Easy Chair by Dum. Taste the rainbow of colors it comes in and it'll be easy to fall in love. We adore the ultramarine blue shown above. Natch. Third Row: Versace! Versace! Versace! It wouldn't be a proper A-List without some couture coveting from one of our favorite fashion houses: Versace. We are seeing a lot of laser-cut love this season and we are hoping it translates over to interiors as well. I need this dress, in this color and I need a body transplant to wear it! Stargazing season has begun and we've been keeping an eye on these Star Sign Trinket Dishes for some fun, colorful accessorizing with your zodiac, again from Anthropologie. Our recent discovery, Anna Karlin, just doesn't make chic stools and amazing pendant lights. She also makes insane home decor as well. We love these sculptural glass cloche's by Thomas Eber's Closet of Curiousity. Each is unique and would be a bright addition to your cocktail table top. Huge fans of the casegoods and such from Shine by Sho, but did you know they do GORG bespoke rugs as well? We love this colorful catch called the Remy. Talk about a statement piece in a room. We love the pattern and the color choices on this one. Bottom Row: The Perrin Perforated Purse. Say that three times as fast as you can. And this melon and fuchsia color combo on the ball bag?! Bananas. We have been digging the fabulously relaxed Paola Lenti Float lounge chair from Haute Living. It comes in the most fun array of colors that will perk up any indoor OR outdoor space. We are always a sucker for good sunnies -- this season's pick? The Thierry Lasry x Dr. Woo lunettes from Colette. Black and brass and needing to be a part of my spring wardrobe. Stat. This season's lacquer love goes out to Chelsea Desk from Scenario Home. It's very Miami Vice meets Palm Beach and the perfect place to write your coordinating, Lilly Pulitzer thank you cards. Perfect in the Ocean Blue hue. Have an amazing time springing into these fabulous springtime finds. We are all over it already. I am a full-on, self-proclaimed accessory queen. I love accessorizing -- whether it be thru fashion or thru one's home. I could spend HOURS zhushing library book shelves or fussing over tchotchkes on a cocktail table. It is my most favorite part about completing a house. We are in the midst of finishing construction on a few projects and I have major accessories-on-the-brain. I cannot wait to buy everything to finish the space. Taya had to reel me back in the other day as I was making my wish list for one project's bookshelves when we clearly had more important things to do. I can't help myself! Instead, we decided to gather some examples of our three favorite styles of home accessorizing on the blog to help you all out when you are styling your space. Delicately layered is the first type of styling we adore and perhaps the easiest to achieve. It doesn't take a lot of items, but just a touch more thought needed in order to properly achieve the look. To get this effortless look, less is definitely more and placement is key. A favorite among clients for sure. Layered Images Courtesy: Capriciously Inspired, Apartment Therapy, Coco La Pine Design. My late, dear friend and founder of Flats Chicago, Jay Michael, often used the styling term "curated" for many of his spaces. I LOVE this term as it's totally apropos with this type of home accessorizing. This heavier look is achieved by collecting things over time (or tricking people into thinking that's what you've done). From stacks of coffee table books combined with artifacts collected from your travels, to pottery and framed photographs -- nothing is ever too much. Everything (and a lot of it) just works. Curated Images Courtesy: House Beautiful, Simplified Bee, Elle Decor. Last, but not least -- the minimalist approach. The trickiest approach to styling your space. Just like selecting the perfect set of bracelets to go with a simple white, button-down shirt -- you ask yourself what will achieve the most impact with just the slightest bit of effort? The same goes for your home. Minimalist Images Courtesy: Source Unknown, Christina Hamoui, Ross Cassidy. We are in the midst of selecting stone slabs for a big project we are working on and we are finding ourselves stoned -- literally. It never ceases to amaze me how the granite and marble and quartzite and other materials we place in our bathrooms and kitchens and on our floors comes from the EARTH. Pressurized rock and elements that over eons and eons of time metamorphosize to create these amazing layered things of beauty that perhaps we often take for granted in our homes. The colors nature creates! The organic patterns! Everything is mesmerizing. Sometimes when I am walking through a stone warehouse and I meander through the rows and rows of slabs sitting elegantly sliced beside each other, I cannot believe that some of these pieces occur naturally. We decided to highlight a few of our favorite applications of stone below highlighting its natural beauty or perhaps just doing something artistic with more simplistic materials. We just love letting the stone shine. LEFT // We are ALL about the matchbooked stone as of late. We LOVE symmetry and we love gorgeous stone so it's a fun way to marry the two for a big WOW factor in a space. And backlit? Slayed. MIDDLE // There is just something so classic and regal about a GORGEOUS piece of marble. The colors, the movement. Always a stunner. We love how this provides a crisp contrast to the brass hood. Mad props on this combination. RIGHT // Again with the matchbook! The installation here though is the stunner. Who would've thought to put this as a backsplash of all backsplashes? Who needs a mirror when you can stare at that gorgeousness day in and day out? Huge fans. LEFT // Calcutta marble tile in a fabulous pattern as a wall feature in this bathroom is tailored greatness. The contrast with the warmth and pattern of the wide plank floor is making us go ga ga.
MIDDLE // The use of patterned marble + wood effect porcelain tiles from Surface Tiles is the showcase in this hotel lobby. Love the use of dark and light. Provides gorgeous depth. RIGHT // Our architect has a favorite saying: Don't go chasing waterfalls, but we can't help but want to chase this waterfall stone island in an amazing, unknown material. Next time you are dicing tomatoes on your gorgeous granite island, don't forget to take time to appreciate its beauty.